President Donald Trump signs H.J. Res. 38, disapproving the Department of Interior's Stream Protection Rule, which was signed during the final month of the Obama administration. It was depicted by energy executives and conservatives as a “witch hunt,” “a politically motivated sham” and a move that would “destroy mining in the West.”: In January 2016, President Barack Obama imposed a three-year moratorium on federal coal leasing, which halted new projects and delayed pending applications for companies to extract coal from federal land. During that time the Interior Department was to carry out an overdue review of the program’s social and environmental costs. A year later, it was an easy target for President Trump, who had promised to save the coal industry from oppressive regulations and slumping sales. On March 29, his administration lifted the moratorium and deep-sixed the study. In his speech at Environmental Protection Agency headquarters announcing the reversal and a host of other measures designed to make life easier for the industry, the president said he was “putting an end to the war on coal.” Interior Secretary Ryan Zinke argued that the leasing program was critical to “energy security” and “job creation”; this week, EPA Administrator Scott Pruitt moved to repeal Obama’s Clean Power Plan, designed to limit carbon emissions. Coal executives admit they don't want more leases because of "downward pressure" and "depressed" markets. But the move to save this industry actually exposed its weaknesses — and revealed a trend that coal companies and the Trump administration have not acknowledged publicly: The companies are scaling back, in some cases shedding workers and passing on the opportunities the federal government now wants to give them. Despite Trump’s best efforts, the American coal industry remains on life support. In private, coal company executives are deeply skeptical about the administration’s ability to alter market conditions. In numerous letters to Bureau of Land Management state offices that I obtained through Freedom of Information Act requests, the coal industry acknowledged the continuing decline in demand, and in several cases companies withdrew pending lease applications. The letters were written after the BLM asked companies to update their lease applications since the moratorium had been lifted. This is hardly the picture of an industry on the rebound. In the letters to state BLM offices obtained through FOIA requests, coal companies admitted that the future is not as rosy as they might have hoped or would like to project. Arch Coal, the second-largest supplier in the United States, referred to the “continued downward pressure on the Powder River Basin and subsequent reduced output over the past seven years” in explaining why it was withdrawing a lease application for a major new mine in Wyoming. Rhino Energy, which has operations in Appalachia and the West, said that “current coal market conditions remain depressed” and that it wouldn’t move forward with a lease for a proposed 14,000-acre mine in Colorado until that outlook changed. Cloud Peak Energy, with operations confined to the Powder River Basin, asked the government to reconfigure a proposed lease because it was “simply too large for current market conditions.” And Kiewit , a Fortune 500 contractor and mining company based in Omaha, withdrew its applications for two new mines in Wyoming after waiting for years in the hope that market conditions would improve. 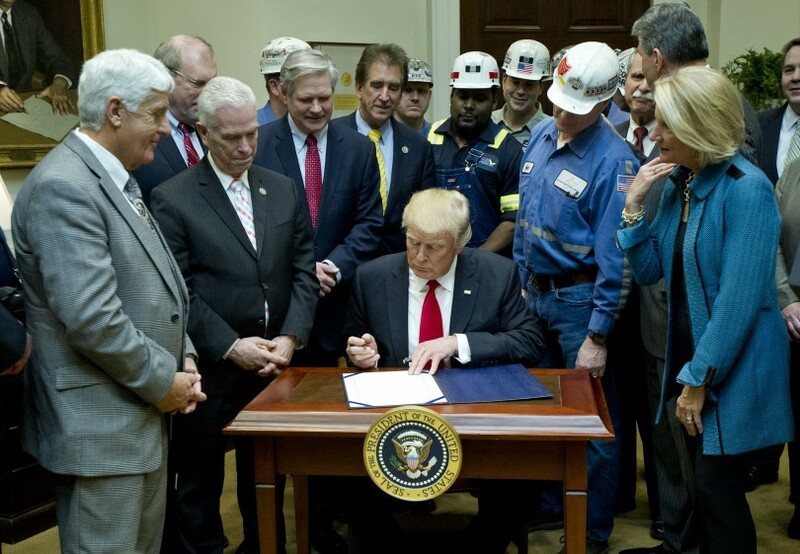 This is hardly the picture of an industry on the rebound, and it is squarely at odds with one of the central promises of Trump’s presidential campaign: that policy changes would revive the ailing sector and create thousands of new jobs in coal communities. Not that the administration hasn’t tried. It has reversed regulations governing the industry, begun to dismantle the Clean Power Plan and repealed a rule that would have forced companies to pay more in royalties on federally mined coal. But it’s not enough to compensate for weak domestic demand, driven largely by the rise of natural gas as an alternative to coal. In the end, lifting the much-vilified moratorium will have little if any impact on the price of natural gas (made cheap by the discovery of huge new deposits in the past decade and advances in drilling technology), declining domestic demand for coal (thanks to the shuttering of dozens of coal-fired power plants) or a relatively flat export market (because of price volatility and the cost of shipping). Those fundamentals won’t change anytime soon. And some companies seem to think their best bet is an outright bailout. Coal companies have struggled to stay competitive through cost-cutting measures including layoffs and in some cases bankruptcy. In public statements, they say they want ready access to deposits on federal lands, which account for about 40 percent of U.S. production, nearly all of it in the Powder River Basin. The mines there are some of the largest and most efficient in the country: The coal is close to the surface, making labor and production costs comparatively low. So the fact that several corporations withdrew lease applications for large mines there despite those benefits is especially revealing. The moratorium on new leases was never going to stop or even slow production: It is estimated that companies mining in the Powder River Basin, which accounts for nearly 90 percent of the country’s federally owned coal, have 10 to 20 years of reserves. If there was suddenly a surge in demand for coal, the industry would be poised to ramp up production from existing mines. That is unlikely to happen. “We don’t think [the industry] is going to need new reserves from the federal government for a decade,” said Daniel Rusz, a research director at Wood Mackenzie, a global consultancy with clients in the financial and energy sector. What no one seemed to anticipate, however, was that coal companies would actually withdraw pending lease applications, suggesting that they have begun to lose faith in the long-term viability of the domestic market. One of Kiewit’s applications, dating originally from 2008, would have expanded the Buckskin mine in the Powder River Basin. But the company’s offer of 21 cents per ton in a bid four years ago was so low that the BLM turned it down; forecasters saw it as an ominous sign for the future of coal. Contura Energy, a spinoff of Alpha Natural Resources, which emerged from Chapter 11 bankruptcy last year, was crowing as recently as late July about the benefits of mining under Trump. In its financial summary and risk assessment for an initial public offering, the company referred to the Trump administration more than a dozen times and said the easing of regulations on the industry was opening new opportunities. “The repeal of the coal moratorium once again allows new leases for coal on federal lands, adding potential new capacity back to the domestic coal market,” Contura wrote optimistically. But the company said nothing about the fact that it had already withdrawn an application for a new mine in Wyoming that would have added 253 million tons to its portfolio. Less than two weeks after announcing its intention to go public, Contura changed its mind “due to capital market conditions.” Officials there did not respond to requests for comment. If companies open new mines, who is going buy the coal in 30 or 40 years? For coal’s champions, inside the administration and out, that’s the rub: The domestic coal market shows no signs of fundamentally changing, and without renewed demand there’s no reason to pursue new leases. According to a March study by Headwaters Economics, 142 coal-fired power plants have retired generators or closed entirely since 2009. That trend is expected to continue. Just this week, one of the largest coal-fired power plants in Texas announced that it would be shutting its doors early next year; a spokesman for the company that owns it called the plant a “money loser.” Moreover, there’s an unspoken acknowledgment that eventually some sort of carbon pricing scheme will be implemented in North America, further dampening coal’s long-term prospects. “There are no new coal plants being built,” said Rusz. If companies open new mines, who is going buy the coal in 30 or 40 years? Recent court decisions have also complicated the future of federal coal leasing, particularly in the Powder River Basin. Last month, the U.S. Court of Appeals for the 10th Circuit ruled that the BLM had to reconsider several lease applications in the region because the agency had not taken into account the potential effects of climate change in its environmental assessment. Those lease applications would expand mines that account for roughly one-quarter of all U.S. coal production.